KXCI is excited to host Tinariwen live in Studio 2A and at Club Congress on Tuesday April 23rd. Africa's Tinariwen bring their desert blues to Tucson for a rare North American Tour. The live performance and interview will be on-air at 5:30pm on The Home Stretch. Tinariwen play at Club Congress Tuesday night in a KXCI Presents! show. Doors open at 8:30pmn with Sihasin. 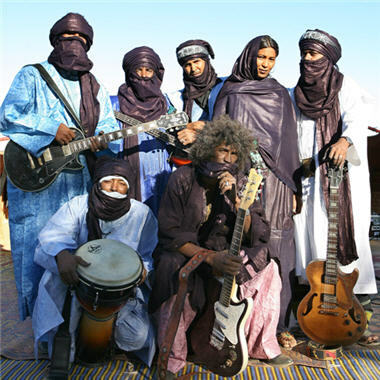 One of the most renowned groups in global music, Tinariwen's music is the soundtrack of the Touareg revolution in Saharan North Africa which was created by putting down arms and picking up electric guitars. Plaintive rhythms created a unique desert blues whose lyrics rage against world indifference and evoke a longing for disappearing freedoms. Tinariwens use of electric guitars and call and response vocals creates a style of desert blues that is at once exotic and familiar.